In this rhyming celebration of playtime, bilingual Maya Papaya welcomes all four seasons with a flair for dress-up and an inclusion of Spanish words in an English narrative. 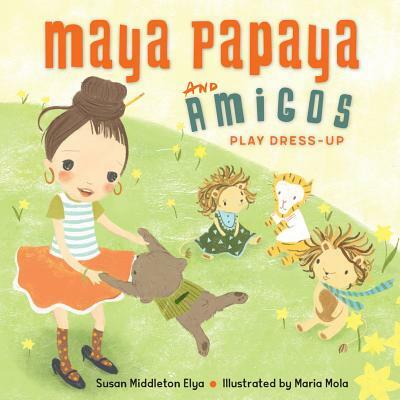 Strong writing, a spunky protagonist, and themes of playtime and the changing seasons lead to a celebration as Maya Papaya plays dress-up and speaks to her toys in English and Spanish, going on adventures and making the most of their time together. Expert author Susan Middleton Elya is a former Spanish teacher and known for her prolific, award-winning bilingual books for children. Susan Middleton Elya is a former Spanish teacher and the author of several bilingual books for children, including La Madre Goose: Nursery Rhymes for los Niños, Little Roja Riding Hood, and Say Hola to Spanish at the Circus. She owns an antiques and book store in Danville, CA. Maria Mola is the illustrator of several books for children, including Sparkle Boy and Koala Challah. Maria is a freelance illustrator and artist. She is from Barcelona, Spain, but she lives in Chicago with her husband and their two little children. She is passionate about bringing her art to the children’s picture book industry. Follow Maya Papaya and her peluches as they dance and play through the seasons. "¡Ay, Guacamole!" This is a bright little book, full of cheery illustrations and well-metered rhymes that create a delightful story. Maya and her amigos—her stuffed toys, her dog, and her cats—do everything together. From swimming to sledding to jumping in mud puddles, they do it all in style (thanks to their gafas del sol, tacones, and other fun clothes). Small children will easily relate to Maya and her need to adventure with her furry friends and will certainly see themselves in the playful games they enjoy together. Spanish words are used throughout (printed in italics), and most children and adults will be able to figure out their meanings using context clues, even if they do not know Spanish. However, a glossary in the back defines anything readers may be unsure of, with helpful phonetic spellings of all words. As the illustrated narrative begins with dressing and ends with Maya cuddled up in bed, this is not only a great book for teaching the seasons as well as beginning Spanish vocabulary, but a sweet bedtime book to read aloud. Maya has dark hair, pale skin, and large, dark eyes that seem to be all pupil. The language is fun, the Spanish just rolls off the tongue, and the illustrations offer just enough whimsy. Maya Papaya loves to play dress-up with her pets and stuffed animals. Beginning in spring, the story weaves through the seasons of the year as Maya chooses different clothes for her dog, cats, and stuffies based on the weather. The predominantly English text rhymes and Spanish words, in italics, are interspersed throughout. For example, “Maya Papaya puts on tacones/to dance with her tigres and bears and leones./All her peluches silently clap,/while two little gatos secretly nap.” The italicized words are all featured in the illustrations, which enhances comprehension. Each Spanish word is also located in the glossary at the end of the book, with the correct article (el, la, los, las), a pronunciation guide, and the English translation. The detailed illustrations are digitally created and feature soft pastel colors. Learning opportunities abound in this picture book, beyond the obvious vocabulary and second language development. A science extension with the weather and seasons and a math tie-in with basic counting are two suggestions. VERDICT A great addition to early childhood classrooms and most library collections. Elya weaves a lilting, rhyming story about the seasons, as explored by young Maya Papaya, who loves playing dress-up with her plushies and discovering each season’s beauty together. Maya takes her stuffed-animal friends out on excursions, rain or shine, after (of course) putting on the proper attire and a positive outlook. The soft, adorable digital illustrations depict button-eyed Maya and her personality-rich toys, as well as plenty of comical background details. All of Maya’s plushies have unique characteristics and accessories that add to the visual narrative and give Elya’s verses more depth. Each double-page spread has a four-line poem with several words in Spanish, and the visual clues and context hint at meaning, while the meter will help kids pick up pronunciation–“They sit on las sillas, drink from their tazas/ and nibble the pie made from orange calabazas.” There is also a list of translated terms in the glossary, making this an easy language-learning tool. A nice pairing with Jen Arena’s Marta! Big & Small (2016) and Yuyi Morales’s Rudas: Niños Horrendous Hermanitas (2016).